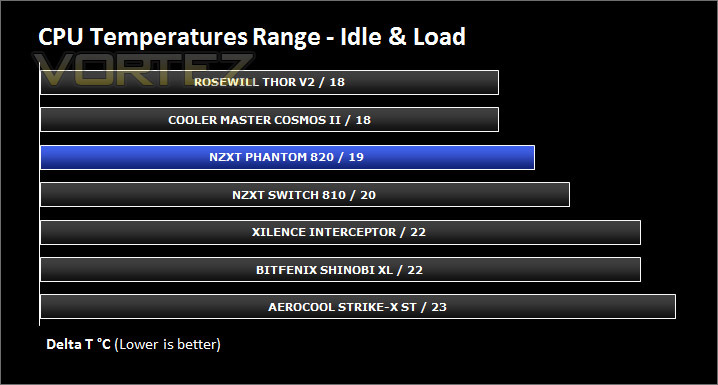 Back in 2010, NZXT released the first computer chassis to join their new Phantom series. Since its arrival to the market the Phantom has captured the hearts and favour of many due to its unique looks and smooth styling. NZXT have since then brought to market the Phantom 410 which is a smaller variant, making it even more affordable for enthusiasts to consider. It wasn't long before NZXT began work on the bigger brother to the original Phantom case. The 820 is the flagship to the series, taking size to the extreme and catering for master builders and those who require water-cooling avenues. Today we will be taking a look at the Phantom 820 and discovering if it has the same strengths as its siblings. Since 820 is designed with XL-ATX in mind it’s only fair that we have installed our XL-ATX test system inside the chassis. Inside Interceptor there are 4 pre-installed fans positioned in traditional airflow regions which should create good, positive airflow. Fan speed will be set to maximum for each fan. To discover the thermal performance of the Interceptor I will record idle temperatures after 20 minutes from a cold boot. I will then stress the system and temperatures will again be monitored after 30 minutes have elapsed. 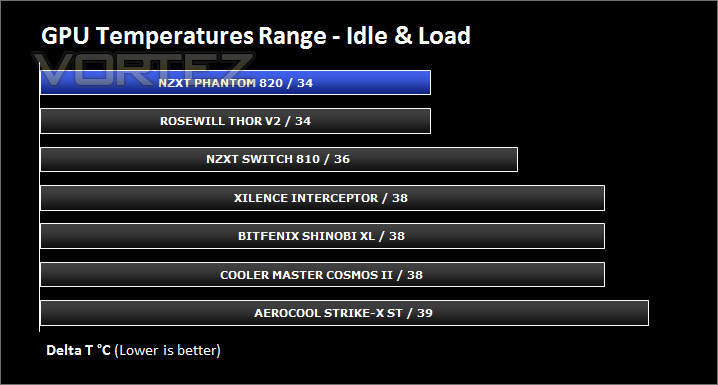 For the purpose of accurate analysis the idle and load temperatures for CPU and GPU will be recorded and the range between idle and load will be calculated to determine how efficient cooling is. The Phantom series has always had a strong following for a combination of reasons. First and probably foremost, its visual appearance lends itself to being unique and one which is highly favoured in hardware circles, other reasons are the excellent cooling and build quality to accompany these distinct looks. So does 820 deliver similar characteristics to its siblings? Phantom 820 offers a super-sized addition to the family, having support for XL-ATX, E-ATX and lots of water-cooling options whilst still maintaining the style that many still love. 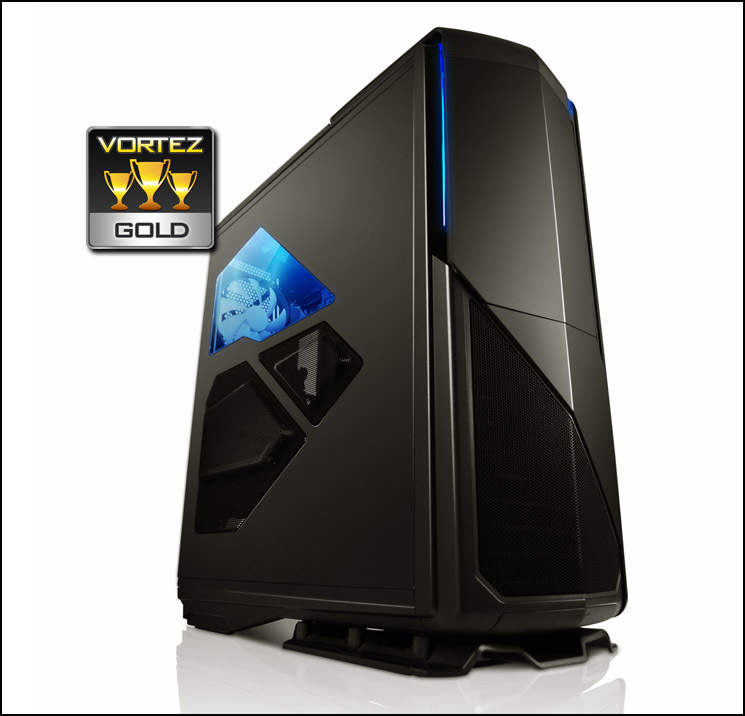 Inside, big CPU coolers and long graphics cards can be housed without any issues whatsoever due to the generous clearance. This clearance can also be experienced with cable management too, the distance between the back of the motherboard tray and side panel offers substantial space and there is ample storage for redundant cables. The computer chassis market is littered with plenty of options and it can be very hard for manufacturers to diversify and stand out from the crowd but NZXT have introduced some significant features in a bid to take bring themselves to the fore. Features such as the hue lighting system is innovative; colours can be adjusted on the fly and a unique rear IO led can be activated to assist with connectivity at the back of the system. Priced at £200 the Phantom 820 may surprise many by being quite a hike in cost based on the materials used but as soon as you consider the numerous features this flagship incorporates and its something which isn’t too hard to justify.